The follow are mods (modifications) I've made for Quake(1). I enjoyed every moment of making mods for Quake, and wish I had the time to make more. It boasted a great community and a really good gamecode language called QuakeC which I became familiar with through asking questions from fellow coders, and tinkering with bits of existing code. Most of my coding knowledge came from Quake, and is now at the point where I can comfortably code Total Conversions for it from scratch. My own AI completely from scratch. 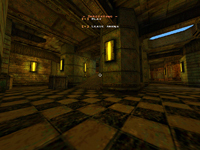 Quake provided a great testbed, with some very interesting limitations. I didn't complete the bot, however it was at a playable stage and very human-like. The routing is done via waypoints (manually placed in this early version) and the calculations are staggered and also calculated realtime, allowing for dynamically altering paths, ideal for such things as lifts/moving platforms. Contains a heap of fuzzy logic and ended up resulting in a lot of emergent behaviour when observing them play. I will continue to develop my own AI theories in another engine developed by a friend, including intelligent automatic waypoint generation, using height as an advantage and cutting off the player as well as tracking them via sounds they hear in the level. If you wish to know more about this bot, feel free to contact me. One of the largest mods I've created, LordHavoc also helped out, creating the core of the arena systems. Being one of the Quake communities strongest members ever, it was great teaming up with him on code. I also assembled a team of level designers to help work with me on this one. I would have jumped onto the level design myself but I was busy juggling a lot of code. Basic premesis of the mod is that there are multiple arenas people can play their own independant matches in, some are duel and some are teamplay (decided by the level designer via entities they've created). 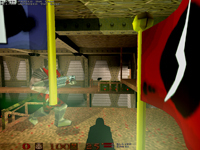 Players fight off in a last man standing style gameplay, until nobody is left... in the duel arenas there's a queue of players to step up and challenge the winner, in teamplay the last team with a player still alive is declared the winner. Even though this mod was released relatively late in Quake's lifespan, it was well accepted by the community and some servers were fired up specifically for it. A total conversion I coded completely by myself (and did level design for) from scratch within 3 months while at Uni and working my part time job at McDonalds. This mod has an insane amount of content, 6 player classes available, 9 weapons, 2 gamemodes (CTF and Assault), vehicles you can enter/exit (unheard of in Quake1!) and is playable with bots. Lego characters battling it out with such violence provided for some great comedy and i received a High Distinction and lots of questions about how i accomplished all this for my efforts. Without a doubt the most popular mod I've released. This mod has been ported to Dreamcast/Xbox Quakes, bundled with peoples online Quake builds, and has received many great reviews since its release. Even today I'm still receiving emails from people who would like a new version and are really happy playing the mod on lan and telling me I should continue to support it. 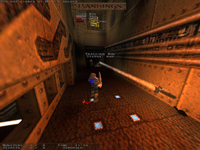 For the most part, this mod is a port of Quake 3 weapons and items... but with a slight twist. 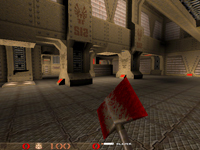 I've sped up the gameplay to suit the Quake 1 levels more and create more hectic gameplay. 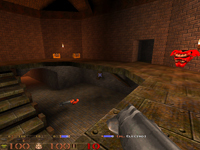 Weapon switching is instant and many delays that plagued the speed of Quake 3's gameplay were tweaked/removed. I created a tournament/single player experience for those who were unable to play online and that too received great feedback. Featuring the AI of a bot by FrikaC. FrikaC did some great code for this worthy of mention, such as the announcer bot spawning on level load as well as the initial pickup and weapon behaviours. 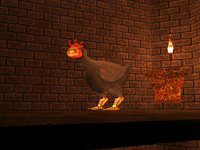 Based off the Quake 2 counter-part, the objective is to find the chicken within the level, grab it, and continue to hold it while you score points over time. You have no guns while you have the chicken, but everyone else does! This was a fun quick mod to make. I worked on this mod with another fellow named Kryten. He did most of the code as I was just learning the codebase. I was mainly responsible for tweaking the gameplay to be fast and fun, and that the weapons/items matched Quake 2 as faithfully as possible. Based on FrikaC's Frikbot, this bot was modified to play CTF and follow orders! I coded in more advanced teamplay tactics that are required for CTF and you had a popup in-game menu that allowed you to execute commands to the bots. You could make groups of bots to send the commands to, or yell at your entire team as a whole. Provided a great option for people unable to get online and play CTF against human opponents. Some commands included: Follow me, Attack, Defend, Retrieve our flag, Camp here, Free roam. Alternatively the player could let the bots go on their own and they would assume a leader and he would give out orders automatically based on what he thought the best stratergy was at the time. In addition to this of course I also coded in the behaviours for the bots to understand the CTF gamemode itself. 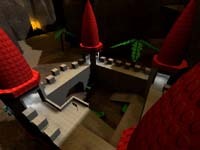 Made about a year or so before Bombing Run made its first appearance in Unreal Tournament. This mod had very similar gameplay elements to that, with the addition of class based action. This gave more emphasis on teamwork as different players would be useful in different situations and the players would be forced to pass the ball around much more in order to win. Incompleted, although I would like to revisit this mod someday, most likely for a newer game engine though. Level featured in the screenshot on the left is by Biff!